130 min. Warner Bros. Pictures Distribution. Directors: Wolfgang Petersen, David Richard Ellis. Cast: George Clooney, Mark Wahlberg, Diane Lane, Mary Elizabeth Mastrantonio, John C. Reilly. An expertly crafted Hollywood entertainment, The Perfect Storm recounts with reasonable accuracy the true story told by Sebastian Junger in his non-fiction book of the same name. Screenwriter Bill Wittliff (Lonesome Dove) and director Wolfgang Petersen (Air Force One) err on the side of dramatic overstatement and too-obvious dramatic setups (all neatly paid off), but they can be lauded at least for their research and the resulting verisimilitude regarding the Gloucester, Massachusetts fishing community and the terrors of the fall of 1991. It was then that the greatest storm in recorded history battered the region, when three powerful fronts collided to create "the storm of the century." The film begins by establishing the stressful existence of commercial fishermen (who must leave their families behind for long runs), especially the captains pressured by bosses and crew alike to bring in a big haul. It's make-or-break time for Billy Tyne (George Clooney, knowing better than to attempt the Boston accent), who, as captain of the Andrea Gail, is at the far end of a "cold streak." Having only just returned from an exhausting run, he feels he can't turn down the chance to turn around on another, so he rounds up as many of his crew as he can convince to come along. Though Bobby Shatford (a perfectly cast Mark Wahlberg) and his girlfriend Christina (Diane Lane) have a bad feeling ("The Grand Banks are no joke in October"), they need the money, so Christina frets as Bobby heads out to sea. Also on board: Tyne's old friend David "Sully" Sullivan (William Fichtner) and divorced dad Dale "Murph" Murphy (John C. Reilly), two chafing personalities who quickly go for each other's throats. They learn to apply their energies to the tasks at hand, which include "rogue waves," a "man overboard," a frisky shark, and of course the "perfect storm" of the title. Why keep at it? As Junger makes clear in his book (and Wittliff follows suit), the answer is economic necessity, which adds a further dimension of tragedy to the natural disaster. There's also the ineffable pull of the sea. Tyne bounces off his friend Linda Greenlaw, "You're a goddamn steamboat captain. Is there anything better in the world?" Another point of dramatic interest is the long shadow cast by the history of Gloucester, the oldest fishing port in America. The film opens ominously on City Hall's wall of men lost at sea (it's no spoiler to suggest we'll see this wall again at film's end), and Tyne laments midway through the picture, "No antenna. No radio. We're back in the 19th Century!" This is about as subtle as Petersen's film gets, but the man knows action, and he sets audiences to nailbiting as Tyne and crew fight head unaware into the fight of their lives. A parallel story involving the Coast Guard's multiple rescue attempts during the storm pays honor to that institution's amazing bravery while furthering the suspense. Wittliff constructs The Perfect Storm as a series of grippingly fateful "moments of truth." Yes, the personal dramas are simplistic, and dealt with in a somewhat hamhanded manner, but try not to have a lump in your throat by film's end when the storm has subsided: good luck. Petersen has the best support Warner Brothers could buy: Oscar-winning director of photography John Seale (The English Patient), Oscar-winning composer James Horner (Titanic), and Stefen Fangemeier, who was nominated for an Oscar for creating this film's stunning 100-foot waves. 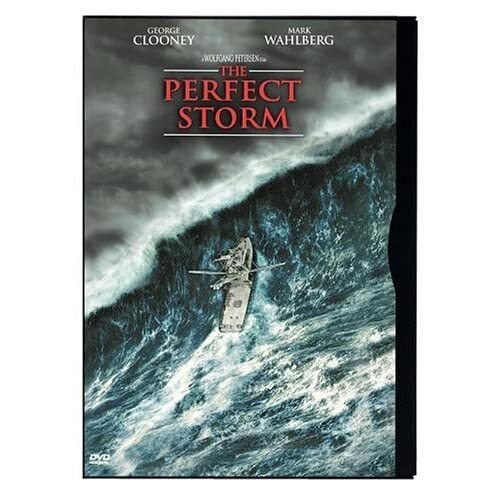 Warner's Blu-Ray upgrade of The Perfect Storm offers some welcome improvements in AV quality, as well as all previous DVD and HD-DVD bonus features. The image still has some problems that keep it from being wholly dazzling: there's some edge enhancement, an early bar scene stands out as unnaturally bright, and the picture can be soft at times. Nevertheless, this is a solid presentation that easily bests DVD. And the Dolby Digital TrueHD soundtrack is truly awesome, bombarding the listener (in a good way) and putting him or her in the middle of the film's perilous action. The centerpiece of the bonus features is a set of three screen-specific feature commentaries: one with director Wolfgang Petersen, one with author Sebastian Junger, and one with visual effects supervisor Stefen Fangmeier and visual effects producer Helen Ostenberg Elswit. I suppose it depends on your personal interest, but I'd recommend heading first to the Junger commentary. The crew commentaries aren't bad, and they provide the sort of information you'd expect from them, but Junger takes a detailed look at how the film reflects reality, beginning with how the early scenes dramatize the major issues in the lives of Gloucester fisherfolk and proceeding to sort out the instances where the script strays from fact in the interest of clean dramatic lines. The video-based bonus features, all presented in standard definition, give some glimpses behind the scenes and at the true story. "HBO First Look Special: Creating The Perfect Storm" (19:56) is a familiarly constructed featurette on the film, its quest for accuracy, and its special effects. The impressive array of interview subjects includes Petersen, Junger, Fangmeier, Gloucester swordfisherman George Schlichte, George Clooney, commercial fisherman Capt. Jim Robinson, Mark Wahlberg, Diane Lane, John C. Reilly, John Hawkes, producer Gail Katz, Rick Shatford, production designer William Sandell, Mary Anne Shatford, Linda Greenlaw, Mary Elizabeth Mastrantonio, former Andrea Gail captain Tommy Porter, commercial fisherman Hooper Goodwin, animatronic fx supervisor Walt Conti, Allen Payne, Karen Allen, Josh Hopkins, William Fichtner, and digital artist Habib Zargarpour. "Witness to the Storm" (4:32), though short, is more interesting and valuable for its collage of remembrances from Gloucester residents and fishermen, while "Creating an Emotion" (4:14) allows us to watch James Horner at work, conducting the score, and to hear from him about how he does what he does. We also get the photo montage "Yours Forever (Theme from The Perfect Storm)" (4:04), the "Theatrical Trailer" (2:31), and a brief "Soundtrack Promo" (:17). All site content © 2000-2019 Peter Canavese. Page generated at 04/25/2019 03:31:27PM.